“We were experiencing constant belt tracking problems with our 2 tail-end spill conveyors. Both belt conveyors have gravity fed take up’s and whatever we did to track them, the continual wire rope on the counterweights would automatically counter any adjustments that we made. 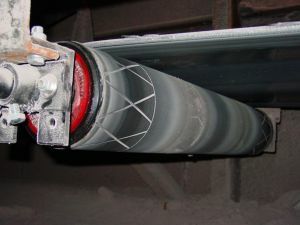 “I had previously used Tru-Trac® Belt Tracking System idlers before and decided to trial one on our worst conveyor. I removed the inverted vee and then installed the Tru-Trac® Belt Tracking System in the same spot which was upside down to the normal fitting method. Our customer is delighted with the decision to install the Tru-Trac® Belt Tracking System. It has met our customer’s expectations and solved their immediate belt tracking issues. After 4 years of continuous use, the Tru-Trac® Belt Tracking System reliably keeps the belt tracked “true” and has required no adjustments to maintain the correct belt alignment. The outcome is that material spillage is successfully avoided and clean-ups are not necessary.